Traditionally Handcrafted Wooden Wardrobes are a visual treat. Almost every handmade product in house has its own place and feel. Wooden Furniture buyers always seek for some uniqueness in their chosen products. Each piece is unique because of the wooden textures and shades available in nature. This Fully Carved Royal Wooden Wardrobe / Almirah is designed precisely for the ones looking for royalty in Wooden Furniture. the make, design and finish of the wardrobe seems astonishing. The traditional royal look of the unit can leave a lasting affect, right at first look. The wardrobe is finely crafted in classic flora and fauna designs. 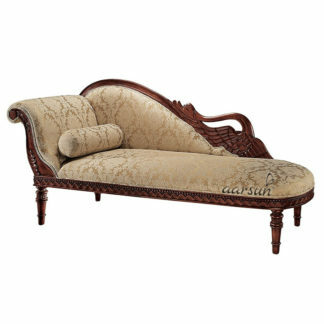 The unit has heavy pillar carvings onto which fine linear design is marked with floral base. Right at the bottom, the pillars have Lions carved out at the base which looks grand. The inner portions of the front panel consists of Kalash Style Design on the large panel and the top panels have floral carvings similar to the ones at the frame and the top. The bottom of the larger panels consists of 2 drawers adjacent to the Lions carved out beneath the pillar design. 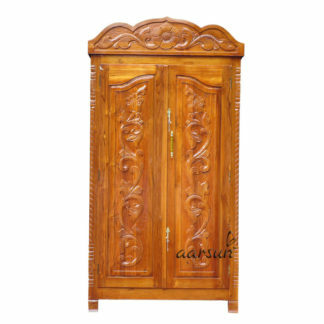 The fine carvings and the design patterns used on the surface of the Wardrobe a one of a kind piece. Moreover, the unit can be made exactly as per your need. The almirah can be polished in a variety of shades and can be used as-is. It entirely depends on your need and choice. Contact us at +91-8192999135 / +91-8266888634 (WhatsApp Also Available) or mail us at support@aarsunwoods.com You can also clear your doubts right now !! Chat with us Now! !